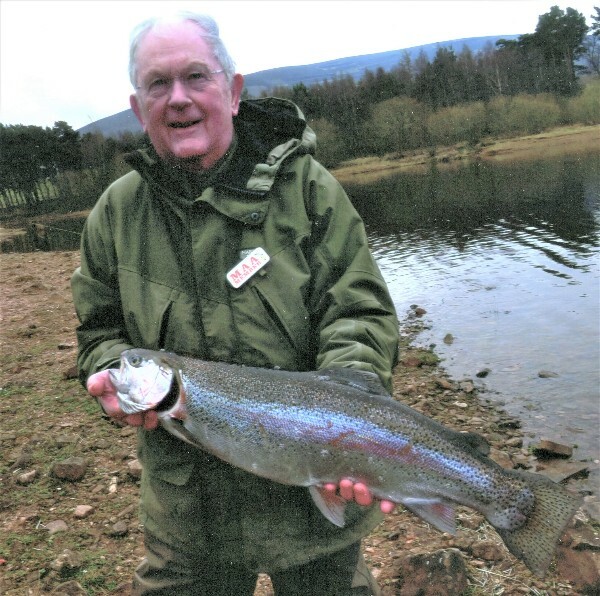 Robert Ross sent me this picture of a super 8lb rainbow trout he caught on opening day, 1st April 2019. This is almost certainly one of the large fish stocked in June 2018. Although we have snow again today, the first couple of days of the season have been very productive with lots of anglers taking multiple fish. Robert was fishing a 7 weight sink tip line, a tapered leader, 6lb tippet and two size 10 flies. On the top dropper a gold head viva and on the point a black hot head dancer. The fish took the black hot head dancer on a slow retrieve, about 3 to 5 feet deep. Fish were also seen taking small black buzzers on the surface. Fly fish in the beautiful Pentland Hills near Edinburgh on Harlaw and Threipmuir reservoirs. Find a permit vendor outlet on the Day Permits page. This reading is taken visually against the depth gauge on the dam wall. I think the the scale is measured in feet. Reservoir Vital Statistics. Threipmuir is full and overflowing at the 2 mark.